September has arrived and with it the greatest beer festival in the world. I speak of course of Oktoberfest. For sixteen wonderful fall days, people will drink, eat, and be merry. So in celebration of that we are taking September to take a closer look at not only the festival, but also the beer that named after it. To start off we are going to take a look at two German brews, one that reflects the reality of today and one that informs the legend. First we will look at the reality. Staatliches Hofbräu-München has been brewing beer for the Bavarian state for a long time. They are one of the select breweries allowed to produce for the Oktoberfest and label their beer accordingly. The irony is our first beer doesn't look anything like what you would expect an Oktoberfestbier to look like. So what gives? When you look at the parameters that define Oktoberfestbier this beer actually is. It is brewed according to the Reinheitsgebot, around high 5, low 6 percent alcohol, and the brewery is within the city limits of Munich. That's it. That is all it takes for a beer to be an Oktoberfestbier. Turns out Oktoberfestbier is a bit of a misnomer. For over 200 years the beers served have varied from dunkel, to bock, to märzen, and since 1990 all beers brewed and served at Oktoberfest have been golden colored helles brews. The festival has evolved with the times and so has the beer. Basically, Oktoberfestbier is dictated by whatever the popular taste is at the time. We will get more into this craziness later in the month but for now lets dive into the beer. Hofbräu Oktoberfestbier is one of the beers you will find in the tents at Oktoberfest. 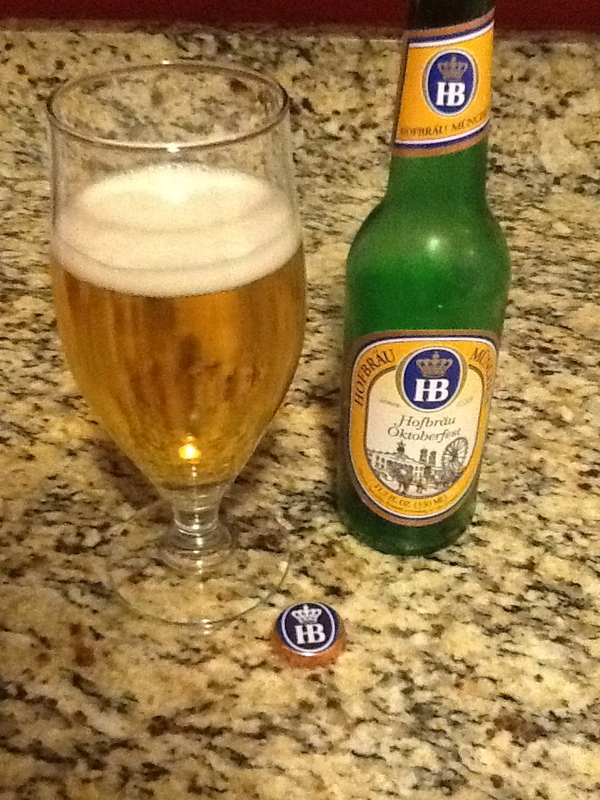 It is a Helles style beer, but due to the rules it is an Oktoberfestbier. This is the current reality. The beer poured a clear dark golden color, with a small white head. It has a pleasant malty aroma. The hops are up front giving way to a smooth, malty, slightly sweet taste. It finishes bitter but the aftertaste vanishes quickly. It is a very drinkable beer with a nice body on it. Make no mistake, this is a festival lager, a beer to carry you throughout the day, while you eat some sausages, enjoy a pretzel and generally have a good time. It is an average brew that is an easy drinker. It comes in at a sneaky 6.3% ABV. Now for the legend. 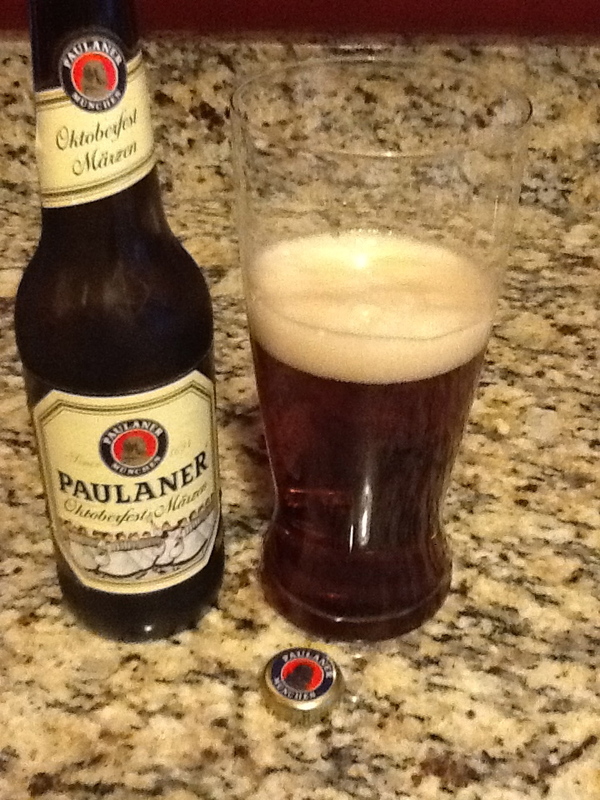 Our other candidate is Paulaner Oktoberfest Märzen. This beer is about as authentic an old world, old school Oktoberfestbier as you will find. As mentioned above, you are 22 years to late to find this in the Oktoberfest tents. For American craft brewers this is the style (maybe even the actual beer) that has informed their Oktoberfestbiers to this day. It poured a rich, clear, amber color with a light tan head that shrank down to a thin layer across the top of the beer. On the drink you get a pleasantly malty, hoppy mix. It has some sweetness to it, and a nice rounded body with decent carbonation. It coats the mouth and on the aftertaste you get a mild bittersweet roasty and toffee nut flavor that sticks around for several minutes. This too is a sausage beer, but it clamors for some rye bread and spicy brown mustard also. As you keep drinking this beer reveals itself as a very smooth and easy drinker. This is a well crafted beer and worth tracking down. It comes in at 5.8% ABV. The Oktoberfest, the world’s greatest folk festival, attracts millions of visitors every year and of course, there’s a special beer here too. But, whether it’s in a bottle or in a Wiesn beer mug, the Paulaner Oktoberfest Märzen is available the whole year round. Its clear amber colour, malty taste, with hints of toffee, and its zesty bitterness will instantly turn your own four walls into an Oktoberfest tent. Over the course of the next month we'll take a closer look at Oktoberfest itself, but beer-wise we will be focusing our efforts on how the American craft brew scene has defined Oktoberfestbier and continues to stretch the boundaries of it. I had no idea those were the only parameters for an Oktoberfest beer. Very interesting. Thinking about picking both these beers up for the hubby. Enjoyed the lesson!